Let’s face it: rings, necklaces, bracelets, earrings, and other jewelry items carry some of the highest markups in the retail industry. That’s why most people prefer to shop the sales and only purchase jewelry that has been marked down significantly. 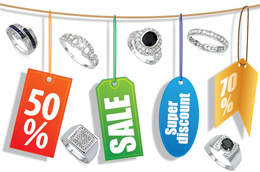 Knowing that sales crop up at each holiday like clockwork, you would have to be really desperate, wealthy, or ignorant to pay full price for a piece of jewelry rather than waiting for the sale. Fortunately, there is an even better alternative to shopping retail sales: jewelry auctions. When you shop at auction, you get amazing discounts plus the ability to shop any time of the year. This makes jewelry auctions excellent deals for consumers who are willing to spend a bit of time educating themselves about jewelry and browsing auctions for the pieces that appeal to them. Jewelry auctions fall into a couple of major categories, each one of which has its own quirks. The first type of auction is an overstock auction. This means that the auction company has acquired their jewelry items from retail stores that ordered too much of a given product. At this type of auction, you can literally purchase the exact same pieces you would find in a store, for up to 80 percent less than the retail price. Overstock auctions are typically very trustworthy in their jewelry descriptions, because they have a deep knowledge of the jewelry industry, and because their pieces come from retail stores with documentation. The next type of auction is a seized property auction. In this type of auction, the jewelry comes from the collection of an individual or business that has lost their property due to legal action of some sort. They may have declared bankruptcy, or they may be liquidating their assets in order to pay a fine. This type of jewelry auction also offers excellent deals, because there is usually an “everything must go” attitude in effect. One last type of auction is a private sale. This could be an estate sale, or an auction of individual pieces on a site like eBay. Private auctions often have higher prices, because the individual selling the jewelry is trying to make a bigger profit, and they usually don’t feel much pressure to sell at a low price. Private auctions can be risky, because you are relying on the word of the seller as to the quality and value of the piece. Ideally, you should avoid private auctions of items that do not carry an official appraisal from a third party. Before you make a bid at a jewelry auction, make sure you understand whether or not there is a reserve, or minimum sale price, on the item. Some jewelry auction sites will mix reserve and no-reserve auctions right on the same results page, so you have to be careful. Most of the time, no-reserve auctions offer the best chance to get a great deal on jewelry because the bidding starts as low as $1. A reserve auction, on the other hand, will have the bidding start at a predetermined price that may not leave much room for bidding up the price while still getting a good deal. Of course, the biggest advantage of buying jewelry at auction is the opportunity to get great deals. In order to make sure you really get a good deal, however, you need to set some limits. Don’t let other bidders push you over your budget! Also, remember to factor in the cost of shipping when setting your budget. Another advantage is the wide variety of jewelry available. This is especially true of estate or seized auctions, because there could be antique or foreign pieces involved that you wouldn’t find at your local jewelry store. One more advantage is the ability to do price comparisons at multiple sellers without even leaving your home. You won’t waste time or gas driving from one location to another like you would when shopping in person. Instead, you can do everything right from your computer, and compare prices at auctions around the world. You can also visit retail jewelry sites to compare the auction price to the retail price. The biggest disadvantage of buying jewelry at auction is that you don’t get to handle the jewelry in person. Some auction sites are better than others about describing the jewelry, and of course there will be photos, but sometimes jewelry just looks different when you try it on! You can help minimize this disadvantage by visiting stores, handling jewelry, and familiarizing yourself with different gems, carat weights, precious metals, types of closures and settings, etc. This will help you understand the online jewelry descriptions better once you return to the auction sites. Another potential disadvantage of bidding in auctions is that you don’t get your jewelry immediately. Different auctions allow different time windows for bidding. If you hate waiting, you can minimize your wait time by only bidding on one-day auctions or on auctions that are just hours away from closing. Jewelry auctions are excellent deals because they offer the chance to get a low price. However, in order to get the best price, you have to be patient. This means that you probably shouldn’t shop at auctions when you’re desperate to get jewelry right away, say for a birthday, anniversary, or other event that you need a last-minute gift for. When you’re desperate to buy, you will be more likely to keep bidding past your budget. Getting good prices at auction also requires an understanding of the value of different types of jewelry. Therefore, you should only shop at auction after familiarizing yourself with the jewelry industry. Unless you are a true jewelry expert, you should approach jewelry as a pleasure, not as an investment. This will help you avoid the pitfall of purchasing jewelry you think is a great deal because you can resell it for a higher price. There is no guarantee you will be able to do this! The average shopper should stick to purchasing jewelry they love. If you love it enough to make the winning bid, then that is a great deal for you! Now that you know a little more about jewelry auctions, start exploring and finding your great deals!